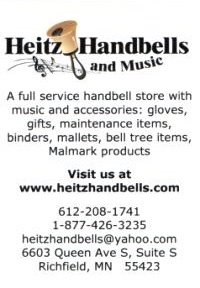 To have your event listed in Ringing News and on the Area’s website, please visit area9.handbellmusicians.org today. Get listed before the Christmas rush! Advertising in Area 9 has never been easier! 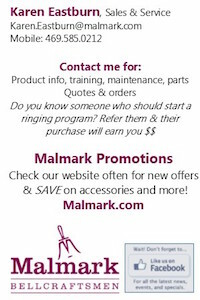 With full-color, digital ads that link directly to your web site, you can reach handbell enthusiasts, ringers, and directors right in their e-mail inbox. With ad costs starting as low as $8.50 per issue, give your products and services a boost with Ringing News digital advertising! 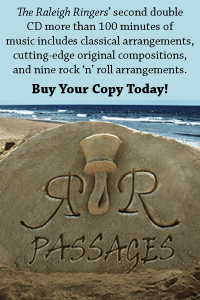 For ad dimensions, pricing, due dates, and more, please visit area9.handbellmusicians.org today. Don't Get Left in Port! Reserve your spot before December 1, 2015! Area 9 Chimes Are at Work! Thanks to you – our members – for spreading the work, Area 9 has loaned both of the three-octave sets of handchimes to educational organizations for the 2015-2016 school year! Susan LaPointe, an experienced Texas-educator, has received one set of chimes for her program at I.M. Terrell Elementary School, a title one inner city school in Ft. Worth, Texas. Lani Garner of Oklahoma has received a set to use in the El Sistema music program for at-risk students in downtown Oklahoma City. This organization has branches in South America and several cities in the United States. Both of these educators feel that the handchimes will offer new musical experiences to their students who, in many cases, have limited opportunities for experience with musical ensembles. We look forward to hearing reports from these two programs and following their progress! Always behind the times, I recently discovered through Netflix the first season of the television show 'Madam Secretary.' It stars Téa Leoni as Elizabeth McCord, a former CIA analyst and college professor who is promoted to United States Secretary of State. Several times in the series, there are references to keeping things within The Company, implying within the CIA. Do you ever think we try to keep ringing inside The Choir? Does anyone else in your church or community know how much fun ringers have in Handbell rehearsals? Do we always keep fun as a secret? Ringers: fun-having is officially declassified! You are free to go about your life telling others about the joy of ringing. In fact, we are now deputizing you as a double-agent. We are sending you out amongst non-ringers. The best place to start is the people you know. Has someone in your Sunday school class recently retired and is now on the look for volunteer projects? Do you know a family new to your community? The weekly rehearsal schedules for our ensembles are institutions. No one would dare suggest a new evening for rehearsal, yet week-night conflicts are common. If you knew of a potential ringer with a rehearsal conflict, would you be willing to recommend them to another ensemble with a different rehearsal schedule? Ringers, we must stick together. Do it for The Choir. The phenomenon known as Distinctly Bronze East was another huge success thanks to ringers from across the country! Area 9 was well represented with many fine ringers and the clinician. Maybe we’ll see you there next year?